The team at one of our luxury casino hotels in Lake Charles, Louisiana, has consistently achieved excellent EcoSure scores, which measure the level of cleanliness of our kitchens. Recently their Stewarding Department, led by Executive Steward Becky Burrows, were able to increase their EcoSure score from 95% to an outstanding 97%. Becky plays an integral role in this property’s success, due to her hard work and dedication to her job and her employees. We interviewed Becky to learn more about the secret to her team’s success. What does an EcoSure inspection entail? What do they look for? EcoSure looks for the cleanliness of the kitchen as a whole. All dish rooms are inspected to ensure the water is at the right temperature and that the sanitizer is up to standard. The inspectors check that no food or debris is left anywhere, and that all equipment is wiped down and dusted. How was your team able to achieve such excellent scores? Our team is well trained in what it takes to keep our kitchens and dish rooms clean, and do this every shift, morning, afternoon and overnight. They clean, dust, sweep and mop everything from top to bottom continuously. We make sure each associate feels valued and a part of the team, so each shift works together to make sure our cleanliness is excellent. What is the largest event you and your team have supported? New Year’s Eve is usually our largest – we have done two seating’s of 800 people apiece. The Stewarding Department helps out the cooks in the kitchen often, especially during events. The team helps to plate the food, which is then run to tables by the serving team. During large events like this, we have employees who volunteer to stay over and help with everything. It’s truly all about the teamwork. Huge events can be fun, because there is a thrill in working together and accomplishing something. The team is like a big family. We treat each other as individuals and make sure we’re training and then working with associates one-on-one. They truly care about their jobs and work hard to achieve consistently great scores. We also place importance on employee engagement events, and take time to listen to our employees and make sure they know they are valued. We have lots of team members who are far from home, from places including Haiti, so it’s important that they feel like they have a family here and are comfortable and involved. When did you join The Service Companies? I started as a Public Area Attendant in 2010 and then moved up to a Public Area Lead, then a Public Area Supervisor, and then a Public Area Night Manager. In 2013, I was asked to become an Assistant Executive Steward. How did you gain your expertise in Stewarding? I gained experience by doing. When I was promoted to Assistant Executive Steward I barely knew anything about kitchens or the department. But, I was able to rise to the challenge and I was able to learn and train as I went. There was always someone there to ask for help or to answer questions. What would you recommend to a property that might be struggling to achieve high inspection scores in their Stewarding Department? First, I would recommend that they check their teamwork. 1st, 2nd and 3rd shift all have to work together to ensure consistency in cleanliness. Standards need to be met all the time, not just before an inspection. I would tell the management team to listen to their associates, to see what they can do to help them achieve what’s needed. What do you love most about your job, and the company? I love my staff – without them, I could not do my job. I’m a people person, and I like to be there for my team and have an opportunity to make changes in their lives. 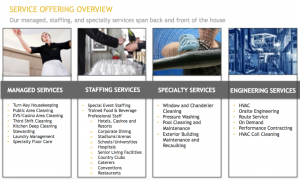 The Service Companies is the unrivaled nationwide provider of cleaning, staffing and managed services to the hospitality industry, particularly luxury hotels, casinos and vacation ownership resorts. With nearly 30 years of experience, The Service Companies approaches their work with dedication, professionalism and a keen attention to detail that leads to best-in-class results.